Ironwood Village Real Estate is a master-planned community of 704 homes. Convenient to the 101 Freeway, and east of Pima Road, this established neighborhood has everything you would want in a residential Scottsdale community. There is a neighborhood park, including tennis courts. DC Ranch’s Market Street retail shopping and dining complex is a stone’s throw away. Copper Ridge Elementary and Middle school is conveniently located with an easy, direct route from this Scottsdale community. Ironwood... native to the Sonoran desert and acclaimed for its natural beauty and longevity… a rich symbol of the unique allure of the majestic Southwest . Like its namesake, the Ironwood Village perpetuates the splendor of its surroundings—with an unparalleled commitment to sustaining a vibrant community, exceptional quality of life and architectural integrity for all residents. Ironwood Village Real Estate truly is a celebration of the spirited Southwestern lifestyle. Your are invited to discover the diverse amenities of this community and its pristine location. 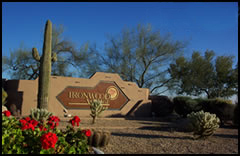 With its unparalleled views of the McDowell Mountains and especially reserved natural open spaces, Ironwood Village is a truly unique community in harmony with its exceptional desert setting. Located in scenic north Scottsdale and combining exceptional living and recreational amenities, Ironwood Village Real Estate is the ultimate future address for any homebuyer looking for a real sense of community and genuine Southwestern atmosphere. Wildlife abounds at Ironwood Real Estate —the desert is home to a broad spectrum of native animals. From observing scurrying quail families and cottontail jackrabbits inhabiting the natural washes to our attractive home designs, the overall effect of living here is one of comfort, beauty and superb quality. When you decide to buy Scottsdale AZ Real Estate, (whether it's Ironwood Real Estate or some other premium Scottsdale AZ Real estate) be prepared to live amidst some of the most renowned luxury resorts and spas, championship golf courses, gorgeous homes, and natural desert beauty in the world. With all these amenities at your fingertips you’ll be living in paradise.